Okay, so not much as been done on the quilt, but it's because I've been busy. Things aren't slowing down much either. Ever want to stop the world for just a weekend? Just to catch your breath? 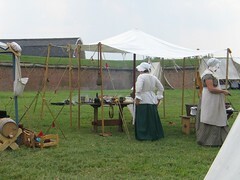 Anyway, I participated in the activities at Defender's Day, an annual event around the Battle of Baltimore in 1814 at Fort McHenry. If you remember your U.S. History, Fort McHenry, and specifically the Battle of Baltimore was when and where the Star Spangled Banner was written. 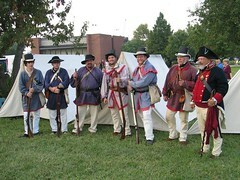 Here are the guys of the Virginia Militia. A dashing lot aren't they? 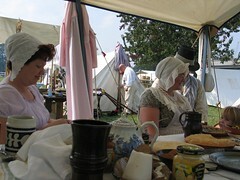 To augment the food provided by the Fort staff, we cooked some beef in a reflector oven, a pie, and some cabbage and ham. It made for a nice demonstration and some tasty food for lunch and dinner. We also had tea time. Debbie brought all sorts of yummy tea things - cakes, tea, jams, you name it. It's always a good event and the evening program is awesome. The program ends with a military band/orchestra playing the 1812 overture with the Maryland National Guard firing their howizters at appropriate points. Then the raising of the 30ft by 40ft flag and playing the national anthem, followed by about 30 minutes of fireworks. Always a good show. Over the Labor Day weekend my mom and I worked on a quilt. Not just any quilt but a quilt top that my great Aunt Minnie had made sortly after my Aunt Betsy was born. That makes this quilt about 35-40 years old. It apparently sat around waiting to be quilted somewhere where it was damaged with some leaks. So, I brought the quilt with me when I was staying with my mom for my Grandmother's 90th birthday shindig. 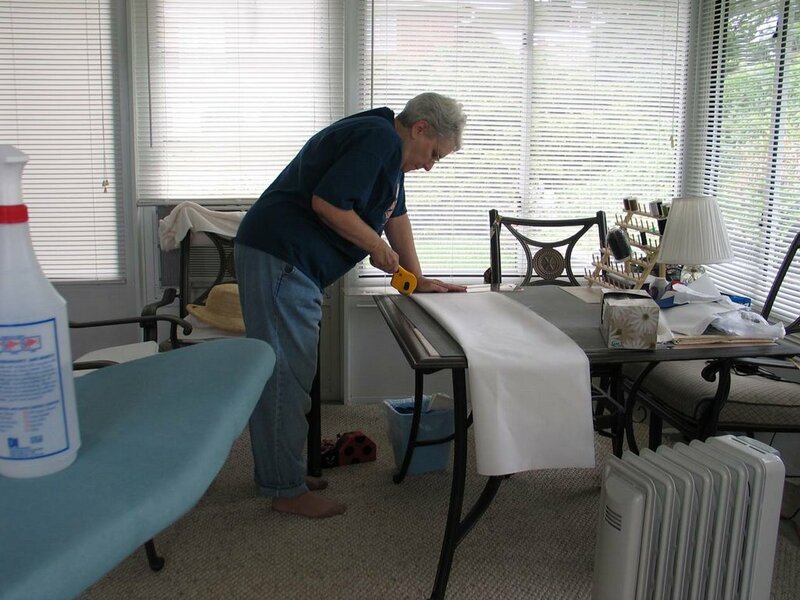 Mom has much more experience with quilting than I do, so she did the cutting. I did a fair amount of sewing. and we came up with this top. The original is what is inside the blue border. We also put on a white border after the blue, but I somehow didn't get a picture of that. 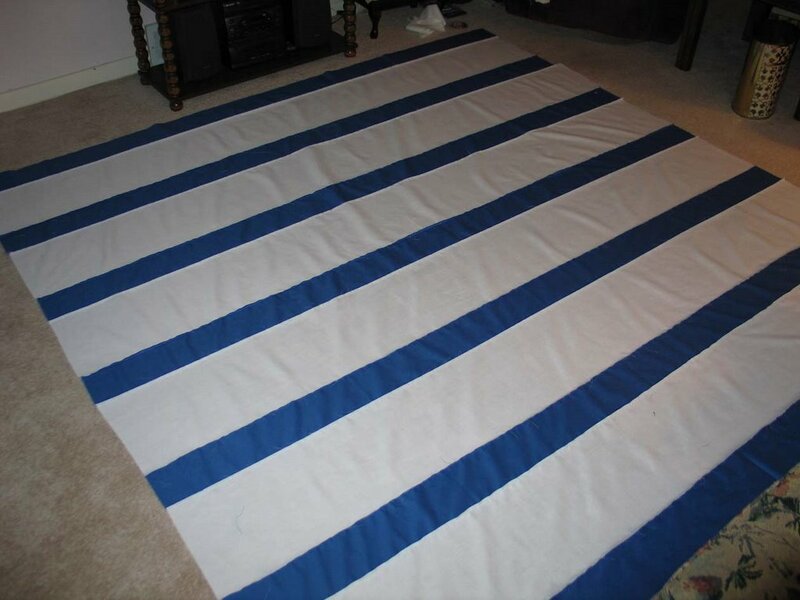 We had to replace a little bit of the white fabric along one end because the stains wouldn't wash out. There are still a few stains here and there, but that's okay. It's part of the quilt's history. Stripes! 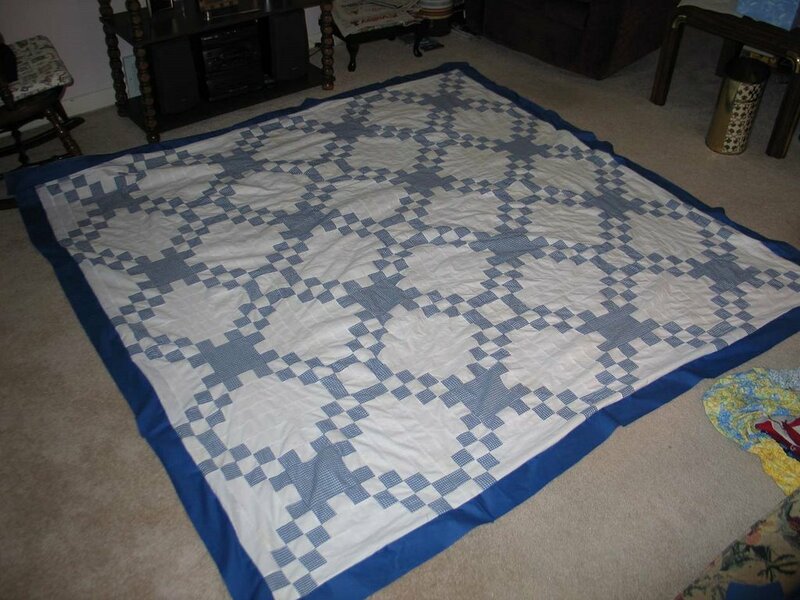 We've since pinned the backing, batting, and top together and it is now waiting for me to quilt it all together. Hopefully it won't be another 30 years before that's accomplished! 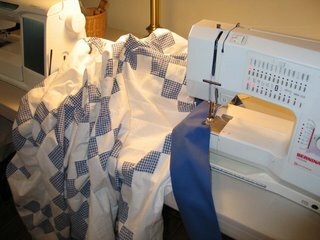 It was fun sewing with my mom. We had never done that before and I hope we get to do it again.